Nike has been a big brand in the sports industry with a wide range of gear, apparel and products. They bring yet another product, this time for the golfers, that combines great looks and superb performance: the Nike VRS Covert 2.0 Irons. They are a better version of the original Nike VRS Covert 2.0 Irons. The perfect companion for those who want to improve their game, this product will ensure a terrific golfing experience. The eight-piece set could be used by most of the golfers, and it is the perfect equipment to get started on your golfing journey. It consists of 4- through 9- irons, pitching wedge and an approach wedge. The stiffness of the shaft is Stiff or S, which will always let you be in control of the swing. These forged irons look solid. The one-piece iron helps good players by giving them the freedom to shape their shots. Nike VRS Covert 2.0 Irons has been designed keeping ease of use in mind. It has the added advantage of delivering a superlative performance, and it scores highly on account of its many great features. It has been designed for right-handed players. It includes a NexCOR face, which is Nike’s very own technology. Buying the right clubs according to a person’s skill level and requirement can seem like an intimidating process. The Nike VRS Covert 2.0 Irons are an ideal solution to this problem.As a beginner’s game might not be as polished as an intermediate player’s game, this set contains just the right number of required clubs. This set of 8 clubs can be extremely useful to beginners and some intermediate players too. They include the 4- through 9- iron along with a pitching wedge and an approach wedge. They are very versatile and you can use them for all kinds of shots. This set contains an approach wedge, which is required for those awkward distances where you cannot use any other wedge well. It also gives you a high level of accuracy and is a useful tool. Nike has made some significant changes to the design of the original Nike VRS Cover Ion﻿﻿﻿﻿﻿﻿s. These changes manage to give this new version a visually striking look. The chrome finish is shinier and it looks more refined than the matte finish. The cavity behind the face is larger and it helps to improve the forgiveness of the club. The back of the cavity has red trim and an angular shape. The edges are soft and make the club look elegant. Nike has not ignored the design aspect and they have got together all the right components to enhance the ease of use of this product. It is solid and does not feel bulky or heavy like some of the other models of this category. 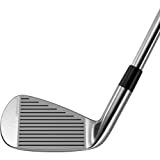 Since it is a forged iron design it helps you improve your game. The steel shaft maybe more heavier than graphite shafts but they are more strong and durable. It may be slightly difficult to swing but this gives it more control and you will be able to swing better. NexCOR face construction with high-frequency X3X face grooves let you combine spin control with blazing fast ball speeds. The club helps you pop the ball up high with the True Temper Dynalite 105 Steel Shaft. While the design isn’t for everyone, the technology will likely have fewer criticisms. The thinner topline and minimal offset hide high-tech, game-improvement qualities. This is a sleek club with a blunt leading edge, which passes through the turf without digging through the dirt. You’ll likely be able to pop the ball up quickly from the green with ease. The club is made from ultra-thin stainless steel which is powerful but lightweight. The True Temper Dynalite 105 R-Flex Steel Shaft lends itself to an easy swing, which lets the ball soar far and land soft. To help control the swing, the grip is Golf Pride Tour Velvet with 360 black and red grip. Well, it’s Nike. They have a hit or miss history on the golf course. But their latest has merged design with function in a bold way which many golfers like. There’s plenty of flash to the design, but it’s all in service of function. With Nike Golf, you’re getting a trusted name based on cutting edge sports science. While other clubs use the cavity design, Nike was the first to apply this design to irons and drivers. They have a proven system based on extensive research. This is a high-end driver. You can certainly find cheaper clubs. This isn’t a club you’ll likely just buy on a whim. But if you like what Nike offers, you do get a lot of club for the money. This is a high-end club with 360 face cup technology and hollow bore-thru design. The club is constructed with a stock steel shaft made from True Temper XP 95 stepless, or a stock graphite shaft made with matrix F94. 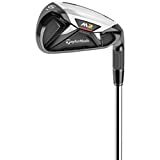 While this is a well-made club, the features found here are fairly standard for clubs at this price point. If you want something truly unique, the Nike VRS is probably the better choice. If you’re looking for a more traditional iron, the Callaway fulfills that role pretty well. 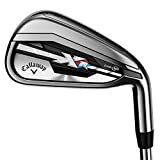 This product comprises of a set of 8 clubs, which include 4- through 9- irons, a pitching wedge and a gap wedge. It is designed for right-handed players. The shaft is made of steel but it does have an option of Regular flex or Stiff flex. They give you great distance and you can have good flight due to its deep center of gravity. The clubhead feels solid as it is forged using the Grain Flow forging process. Although perhaps not as well-known as Nike, Taylor Made has a solid reputation in clubhouses around the world. The SpeedBlade has the lowest CG of any iron in their line as well as a new, elongated SpeedPocket. 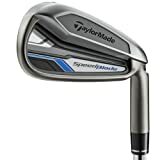 This club is less expensive than the Nike VRS but still packs a lot of design features including individually engineered heads and balanced distance gaps between each iron. If price isn’t your primary concern, you might want to check out the Titleist APR 716 4-PW. This club is described as the most forgiving Titleist ever. The club has a True Temper XP 90 gram stiff shaft but others are available including the Dynamic Gold AMT, KBS and Nippon shafts. If your main goal is to maximize distance, the Titleist is worth consideration. 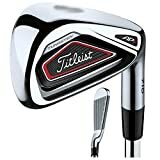 If you’re interested in a club with more all-around balance, the Nike VRS might be a better choice than the Titleist AP1. It is available in both left and right hand orientation. You can choose from a graphite or steel shaft. You have three options of flex to pick from, Regular, Senior or Stiff. It is available in different configurations. It is one of the top ranking products and along with its unbeatable price and performance, it is tough to find a product that will match up to these qualities. It will help you perform better by giving you instant feedback by touch. It does provide you forgiveness but more importantly the feel of a bad shot will make you realize how much you would need to improve. Buy these to help you make the most of your golfing opportunities on the course.